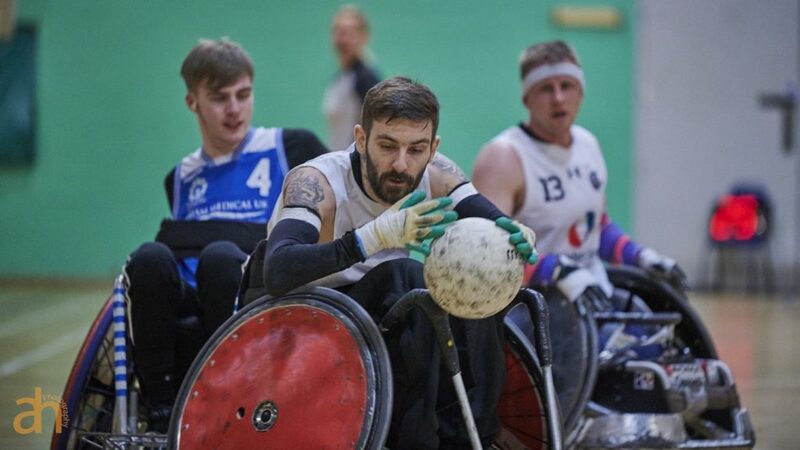 Leicester Tigers top the table after an impressive Super Series 2: Division 1, which took place at Stoke Mandeville Stadium over the 26/27 January 2019. The Midlands based side won 5 out of 5 games, whilst defeating rivals Crash, Storm and Crusaders along the way. Bolstered by Danish star Leon Jorgensen, Tigers entered the weekend with a 100% record. However, the team faced off against title-rivals West Coast Crash and relegation-battlers Canterbury Hellfire in what was a tough Group A. With Jorgenson proving to be the difference, Tigers overcame both sides and won the group, with Crash finishing second. Meanwhile, in Group B Solent Sharks, Yorkshire Lions, London Crusaders and Storm entered into a ‘group of death’, featuring GB stars past, present and future; impressive performances from GB stars Aaron Phipps, Jim Roberts and Chris Ryan showed why they were selected for the King Power Wheelchair Rugby Quad Nations, taking place in March this year. As both London sides battled it out for first and second, Solent Sharks dented Yorkshire Lions’ survival hopes and came third. With Sunday always an unpredictable day on the Super Series calendar, Super Series 2 was no different. As Tigers beat Storm to book their place in the final, a tight game between Crash and Crusaders was taking place. Anything less than a win for either team would mean missing out on this year’s league title. Unfortunately for Crash, Jim Roberts and Matt Hignett were too strong for a stubborn Crash side. Elsewhere, Solent Sharks, Yorkshire Lions and Canterbury Hellfire went head-to-head to try and secure next year’s place within Division One… Gary Banks’ Sharks were first out of the gates with professional performances that saw them secure wins against Yorkshire and Canterbury. The result left both Hellfire and Lions with an uphill struggle to keep their place in Division One. As Super Series 3 fast approaches, there are so many twists and turns yet to come at both ends of the table. Can Tigers secure a consecutive title? Get yourselves down to Leicester Arena on 9-10 February to find out!